Here it is, my predictions for 2019. Overall, I agree with others in the industry that canned wine and cocktails will continue to grow in the coming year. Rosé production has finally outgrown consumption, so prices will drop. Beer will continue to be localized (i.e. less big beer, more craft) but the majority sold within 90 miles of where its made in the brewpubs. Craft spirits/distilleries will continue to grow and increase overall liquor market share. More states will legalize marijuana and there will be the first push at the federal level to legalize it, as well as regulate. A version of the three-tier system for pot will eventually emerge. Given these trends, what is it that I want? If I could ask Santa for anything, how would that look? I want LibDib to open in a number of new states. To be honest, I was hoping to move into new markets a little faster in 2018. But, I spent a lot of time and resources working on our new partnership with RNDC, which is so huge. We are working methodically with them to ensure model is efficient and works well….and new markets are imminent. We did open up the Wisconsin market with another partner, Capitol-Husting. It took longer to get the licensing done, but we are now live and taking orders from restaurants, bars and retailers in the market. Yay! I want to find a couple of new rock star team members to add to my already rock star team. With growth, comes hiring. But, it’s important to find the right people….hard workers, smart, and interested in being part of a small, but stealthy, team of amazing people. Start-up life isn’t for everyone. I was lucky in 2018 (our team is awesome right now and I’m very thankful for that). More new team members in 2019 is a big goal of mine. I want to teach small makers about distribution and sales, while guiding them towards the right resources for success. Compliance is especially important. The key to working in three-tier distribution is to treat each state like a different country when it comes to compliance. Each rule and regulation is unique and can affect a Maker’s business practices. For example, in NY and CA, LibDib as the distributor pays the state excise taxes for out of state Makers coming in. However, in WI, the Maker is responsible for reporting and tax payments. LibDib’s goal is to support small Makers and help them find the right resources to deal with growth and compliance. More of that coming in 2019. I want to work with Makers to find that perfect combo of what I like to call “digital push” and direct relationships with buyers. What I mean is this: how do account visits, phone calls and or emails/texts turn into a placement, and then turn into 5 cases per month? What is that perfect combo of old-school relationship building and digital marketing? I think there is a formula in there somewhere and we as a team will find it and share with our Makers. I want to find the next big thing. LibDib will act as an incubator in many markets. What this means is twofold. 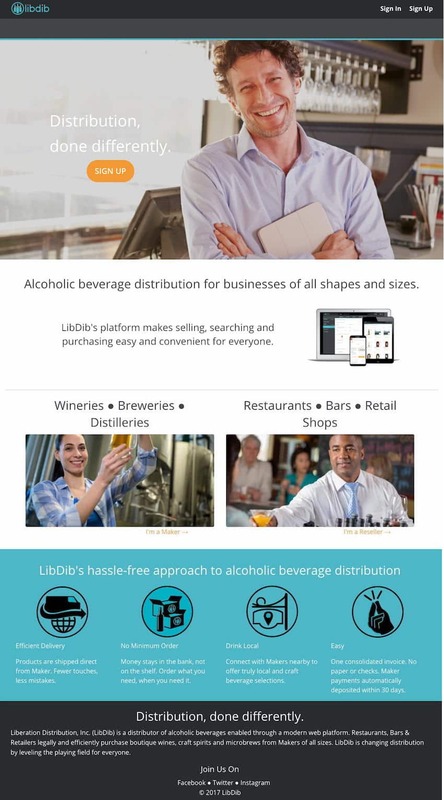 First and foremost (and the crux of our business model) all new brands will have the opportunity to participate in any licensed LibDib market. If products do well and Maker’s want to graduate to a larger distribution model, the option will be there, along with a seamless data transfer. This is so important. As someone who has switched distributors many times—OMG it is so painful getting everything changed over without disrupting service. Data and more data. I think patterns will emerge when it come to small brands catching fire. If everyone has access to compliant distribution, one case at time, what will we see? I am a data dork, and I think data is going to tell some interesting new stories that we have yet to hear.